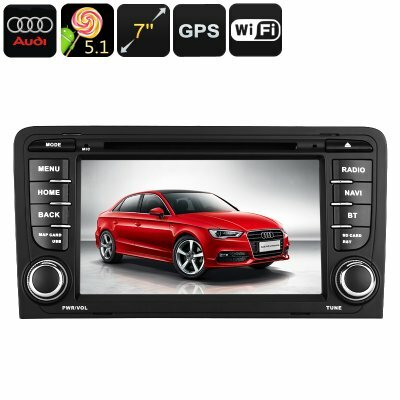 Successfully Added 2-DIN Car DVD Player For Audi A3 - Android OS, WiFi, GPS, 7 Inch Display, Google Play, Quad-Core CPU to your Shopping Cart. Keep your passengers entertained and never experience a moment of boredom on the road again with this 2 DIN car DVD player for in your Audi A3. Being the perfect car entertainment system to pimp up your ride, this 7 Inch DVD player brings countless hours worth of entertainment and joy into your upcoming holidays and road trips. Running on an Android 8.0.1 operating system, this beautiful Dual-DIN car DVD player lets your passengers enjoy all their favorite movies, games, and mobile Applications in crisp HD resolution. By offering 32GB of internal memory and the additional possibility to slide in a 64GB SD card, this car entertainment system holds enough storage for you to save your hour’s worth of entertainment. Access to Google Play furthermore provides you with an unlimited pool of games, movies, and Applications to enjoy. Besides all its media and entertainment purposes, this two DIN car DVD player furthermore supports highly accurate GPS services. With its 20-Channel GPS system, this media player provides you with highly accurate and real-time traffic information anywhere you are. Supporting Android maps, this 7 Inch DVD player for in your car provides detailed 3D maps of your current location and planned travel route. From now on you can be assured to reach your upcoming detonations in the fastest and most convenient way possible. Featuring Bluetooth connectivity, this car media player can be efficiently paired with your smartphone, laptop, or tablet whilst in the car – allowing you to listen to your favorite songs through your car’s stereo anywhere you go. Additionally, this car DVD player also supports regular FM and AM frequencies. With its built-in microphone, it furthermore allows you to engage in hands-free phone calls whilst driving, immensely increasing your overall connectivity and safety on the road. Packing a sophisticated Quad-Core CPU, this car media player lets you watch your favorite movies in HD resolution and play mobile games without dropping a frame. Whether you use it to find your destination during your upcoming holiday, to entertain your passengers, or simply to listen to your favorite songs – this Dual-DIN car DVD player is guaranteed to meet all your demands. This 2-DIN car DVD player comes with a 12 months warranty, brought to you by the leader in electronic devices as well as wholesale electronic gadgets..